Kevin Kodzis is the President of Boston Group. An expert in recycling and diversion, Mr. Kodzis is also the CEO and Founder of sustainable waste management leader DC Environmental. Previously, Kevin served as Vice President of Sales and Marketing for disposal company Republic Services, and managed regional and international sales for The Newark Group, a global producer of recycled paperboard and paperboard products. Mr. Kodzis received his B.S. in Economics from Boston University. Jeffrey Klein is Chief Operating Officer of Boston Group. With over 20 years experience in waste reduction and recycling management, Mr. Klein also serves as Chief Operating Officer and Founder of sustainable waste management leader DC Environmental. 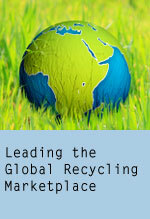 Previously, Mr. Klein was President of Belkin Paper Stock, Inc., and Vice President of Paper Recycling International. A LEED Accredited Professional, Mr. Klein received his MBA from Pepperdine University and his B.S. in Business Management from Arizona State University. © 2019 Boston Group, Inc.